From Interstate 5, exit 238 and travel east to Jefferson. Just east of the arch bridge over the Santiam River, turn right on South Main Street and continue until the street becomes Jefferson-Scio Drive. Continue east into Scio and turn left onto Highway 226. Follow Highway 226 approximately six miles west to Camp Morrison Drive and turn right (south). Alternately, exit Highway 226 from Interstate 5 in Albany and travel to Scio. 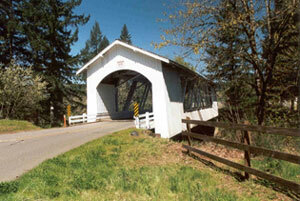 The Hannah Bridge spans Thomas Creek just 1.5 miles from Jordan, where a covered bridge also crossed the stream until 1986. Thomas Creek was named for Frederick Thomas, who obtained a Donation Land Claim and settled on the banks of the creek in 1846. In 1853, John Joseph Hannah arrived by wagon train and was granted a 151-acre tract of land bound by Thomas Creek and Bilyeu Creek. Hannah built one of the first sawmills in the area, powered with water from Bilyeu Creek. In 1912, another covered bridge crossed Thomas Creek just east of the present structure, according to Aileen Howell, granddaughter of Hannah. Lumber from the dismantled bridge was used by the Hannah family to build a tool shed and sheep barn. During the summer months, the bridge is a popular spot for swimmers often jumping from the bridge into the deep pool beneath. Several television commercials have been filmed at the site.